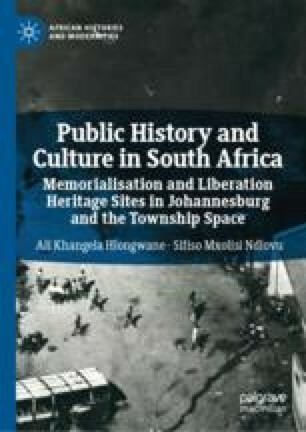 In this chapter, we investigate the 16 June 1976 Interpretation Centre in Central Western Jabavu, Soweto, which complements and develops the narrative mapping of the 16 June 1976 Soweto uprising, that changed the course of South African history and accelerated development towards the then unfolding national liberation struggle which was extended to the international arena through social movements such as the worldwide anti-apartheid movement. An integral and important part of the 16 June 1976 Interpretation Centre is the enriching South African art collection by selected, commissioned, established and emerging artists, several of whom had experienced the Soweto uprising first-hand and recreated their interpretation artistically of their experience. Located outdoors in an open-air museum environment are a variety of dramatic artworks in different media recreating the dramatic Soweto uprising, including two expressive depictions of Teboho ‘Tsietsi’ MacDonald Mashinini, the leading student leader during the uprising; an abstract symbolic portrayal of Regina Mundi often referred to as the people’s church, and a massive monumental painted concrete wall dubbed by the media as a ‘Memorial Wall’. It was painted by emerging artists, and other expressive artworks verifying continued efforts to create an integrated, coherent and comprehensive narrative defined by an outdoor museum space that integrates physical landscape embodying the 16 June 1976 events. Sheree Lissoos’s contribution as a co-author of an earlier version of this chapter is acknowledged.